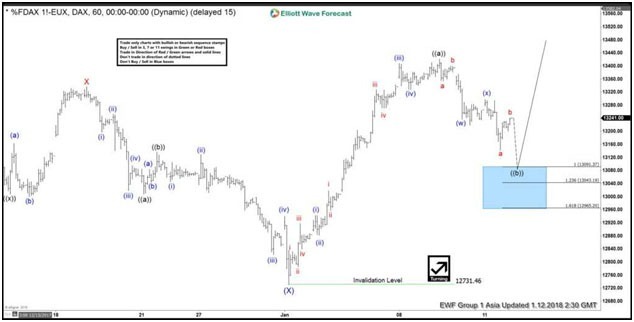 DAX Short Term Elliott Wave view suggests that the decline to 12731.46 ended Intermediate wave (X). 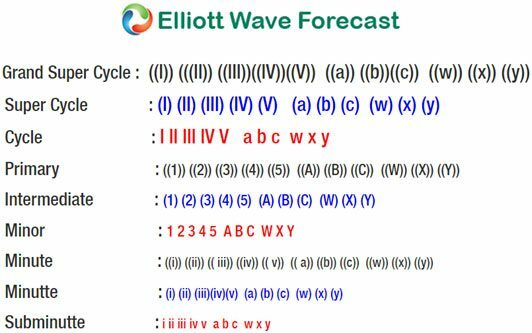 Up from there, rally is unfolding as a 5 waves impulsive Elliott Wave structure where Minutte wave (i) ended at 12943, Minutte wave (ii) ended at 12881.5, Minutte wave (iii) ended at 13408.5, Minutte wave (iv) ended at 13328.5, and Minutte wave (v) of ((a)) ended at 13421.5. Minute wave ((b)) pullback is currently in progress to correct cycle from 1/2/2018 low before the rally resumes. Internal of Minute wave ((b)) is unfolding as a double three Elliott Wave Structure where Minute wave (w) ended at 13237 and Minute wave (x) ended at 13297.5. Index has scope to extend lower towards 13043.19 – 13091.37 area to end Minute wave (y) of ((b)) before the rally resumes, provided pivot at 12731.46 low stays intact. We don’t like selling the Index and expect buyers to appear from the above area for more upside in 3, 7, or 11 swing, provided pivot at 1/2 low (12731.46) stays intact.